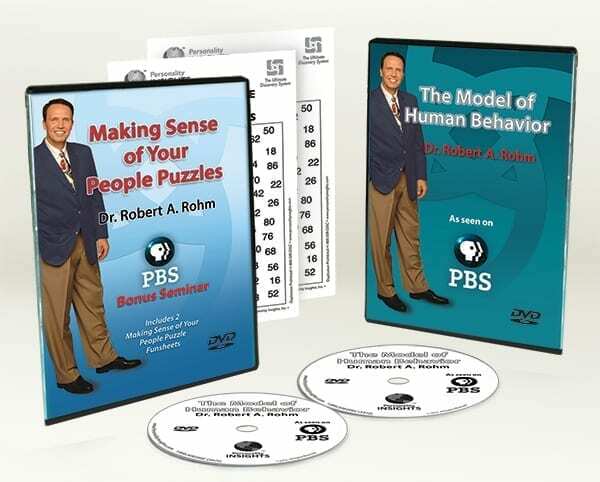 In this fun-filled, fast-paced presentation filmed before a live PBS studio audience Dr. Robert A. Rohm presents the four patterns of Human Behavior. You will never see other people the same way again! Dr. Rohm has a knack for taking complicated issues and breaking them down into understandable concepts that will change your life for the better…forever! Get ready to laugh and learn! In this presentation filmed before a live PBS studio audience, Dr. Robert A. Rohm helps you discover how to become a more effective communicator with everyone you meet. You will learn about the four different personality styles that make up the pieces of the People Puzzle: their needs, likes and dislikes, and much more!